Jacqueline was born in Sydney on the 24th of October, 1967 and started getting her acting lessons at the National Institute of Dramatic Art, after having completed her schooling and high school from Wenona and Pymble Ladies’ college. Right from her early days, she was famed as a singer and during her university days, started doing some modeling for print and television both. A regular student under the famous Bob Smith, her singing rose to the top in parallel. One of her early gigs with the top notch TV series, ‘All The Way’ brought her in the notice of Liz Mullinar, who inspired her to take her course at NIDA. Some of her best theater acts include Child Dancing, Master Builder, Rebecca and many more. She got her chance to cast opposite Russel Crowe in Romper Stomper and it marked the beginning of her successful league in Australian cinema and Hollywood. Her best works include Oliver, Brigadoon, Godspell etc. The fish tattoo that adores her back is a true mirror of her personality which is playful yet intensely intelligent. 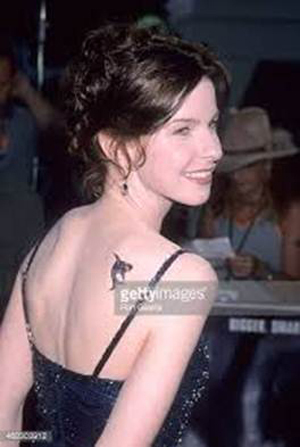 This back tattoo of a dolphin on the right side is black and bold, much like Jacqui’s signature style statement.